The weather report said 98 degrees on Saturday, June 27th, but boy it sure felt hotter! A glance at Lake Liz revealed what we already knew...dead calm. 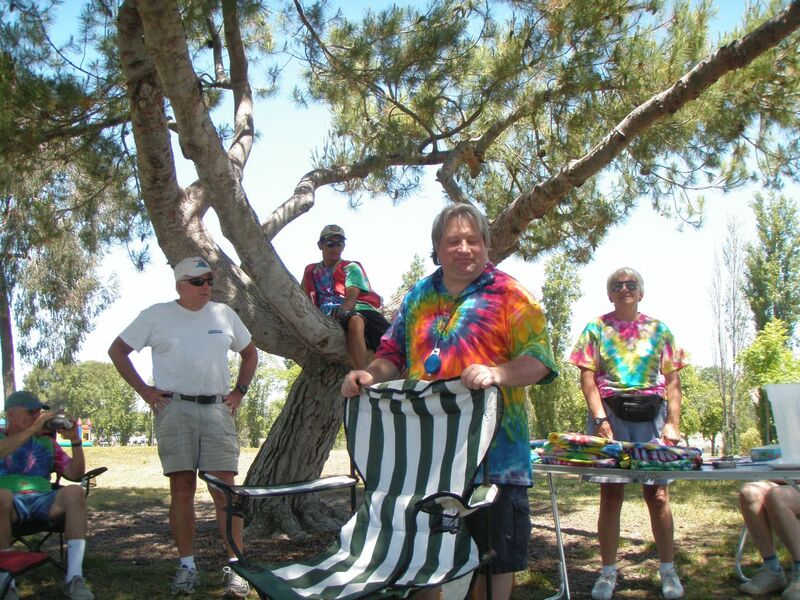 Our race committee, regatta chief, and tie-dye master, Joe Davis, wisely postponed the first race until 1pm when the wind began to rustle the sails and splotches of ripples appeared on the lake. We had 6 boats on the line: Terry Hensley and nephew Joey, Butch Michel and Eric, Hugo and Mary Schmidt, Jack and Jim Navarra, Sidney Lee (single-handing), and yours truly - Harold and Maria Ho. Terry was the sole representative from Morro Bay. Missing were our friends from Sacramento...we missed you, but more on the Sacramento fleet later. Race 1 was thankfully a short windward-leeward-finish. We sweated it out hunting puffs on the lake while Hugo and Mary (new to the Lido and the club, but not new to sailing) led the way all until the last windward leg when Jack and Jim snuck by to take the bullet. Butch took 3rd, Sidney 4th, Terry 5th and last, but certainly not far behind, myself and wife/crew Maria. The winds picked up for the second race and blew consistently (now that's rare!) out of the usual west-northwest-ish direction. Jack again took the bullet, followed by Butch, Hugo, and Sidney. Terry and I traded spots a few times, but the last windward leg favored the left side of the lake we were on so we eked out a 5th. After a lunch and drinking what seemed like a gallon of water, we caught our breath under the shade of the trees. The winds were picking up and Maria and I were spending quite a bit of time on the rails for the 3rd race. Butch had an excellent race and took the bullet from Jack. Likewise, Terry had an excellent race taking 3rd. By then, it was so hot, that Hugo decided to jump into the lake while going to windward. But, before Mary could sail away, Hugo was able to pull himself back aboard...guess they realized that sailing single-handed would have been a disqualification! Amazingly, despite the brief swim, they were still able to beat us to the finish! By the last race of the day, the heat was really sinking in and we were certainly tired, but you couldn't wipe the smiles off of our faces as we were hiking out with the rigging humming in the wind. Jack and Jim took the bullet yet again, followed by Butch, Hugo, Terry and Harold. After the races, we thanked race committee, Joe Davis and Vern Tucker, for the excellent race courses. We must've drank a gallon of water each trying to rehydrate and fortunately we didn't have to send Butch to visit his favorite nurse at the local ER this time! The BBQ at Joe's was excellent. Thanks to Joe's brother, Lawrence, for cooking up the dead chicken and dead cow. Likewise, we were not disappointed by Helga's famous deviled eggs. The wine flowed freely and there was plenty of rich chocolate in the dessert. 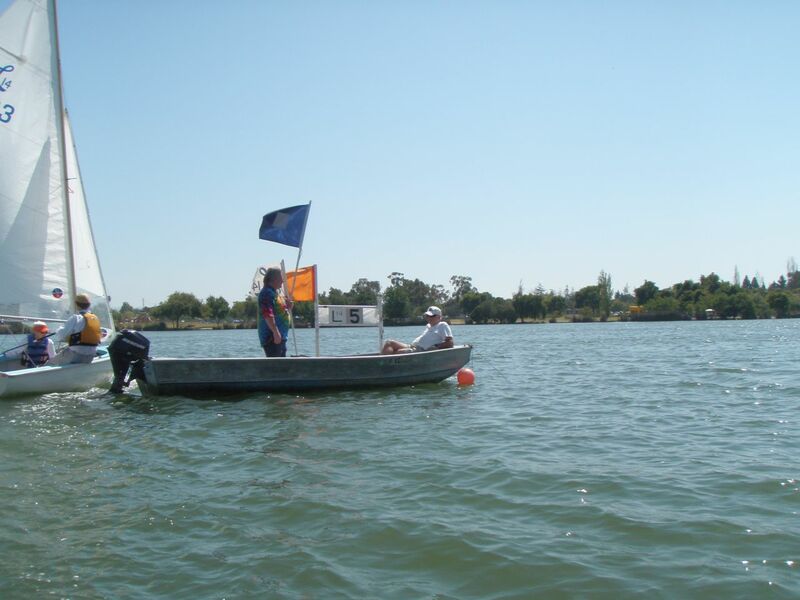 We chatted all things Lido and sailing and welcomed Mark from the Sacramento Lido Fleet. Mark graciously volunteered to be 2010 District II Secretary and was quickly and unanimously voted in. Big thanks must go to Helga Wolff and Carolyn Navarra for all the behind-the-scenes work at the BBQ! 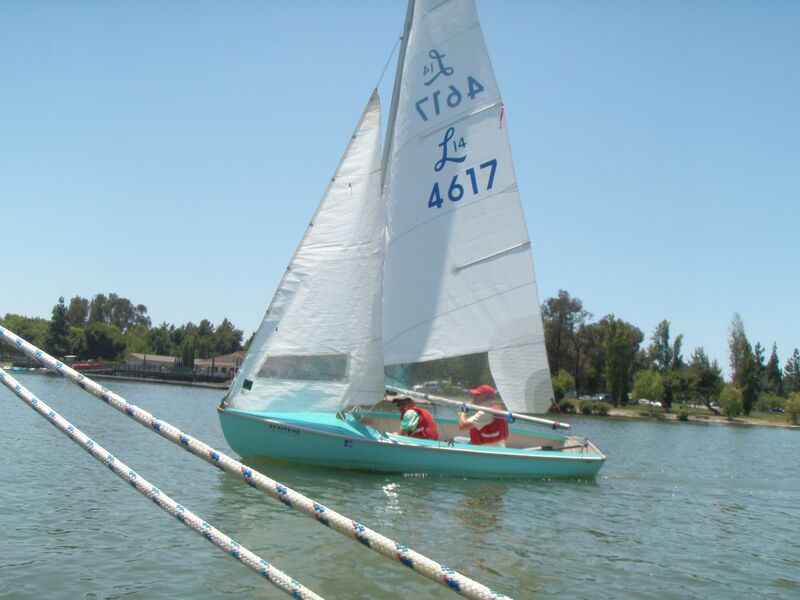 Sunday combined day two of districts with Fremont Sailing Club's Summer Series 4,5,6 regatta. The heat had not relented but we were all well prepared with plenty of cold fluids. Winds were a little more fluky, oscillating from southwest to northwest, but consistently building through the afternoon. All three races were very competitive with all Lido's on the line at the start (or ometimes just pushed over!) and all at finish line within a few minutes. Jack took a 1st, 2nd, and 3rd while Butch had a great day with a 2nd, 1st and 1st! And Terry stormed across the lake to grab a 2nd on the 3rd race! My personal victory was getting not-last-place a few times! Again, though it was sweltering hot, my wife really enjoyed the chance to hike out in the steady winds and there were plenty of smiles on the lake all around. Though weary and sweating while de-rigging, all were in good health and we were thankful to Joe Davis and Helga Wolff for the water breaks between each race. What a great weekend! My only regret was forgetting to bring my camera for day 2 and that more of our friends did not join us from Sacramento and Morro Bay. We're looking forward to Sacramento hosting next year's districts. 'Til then, fair winds and happy sailing! 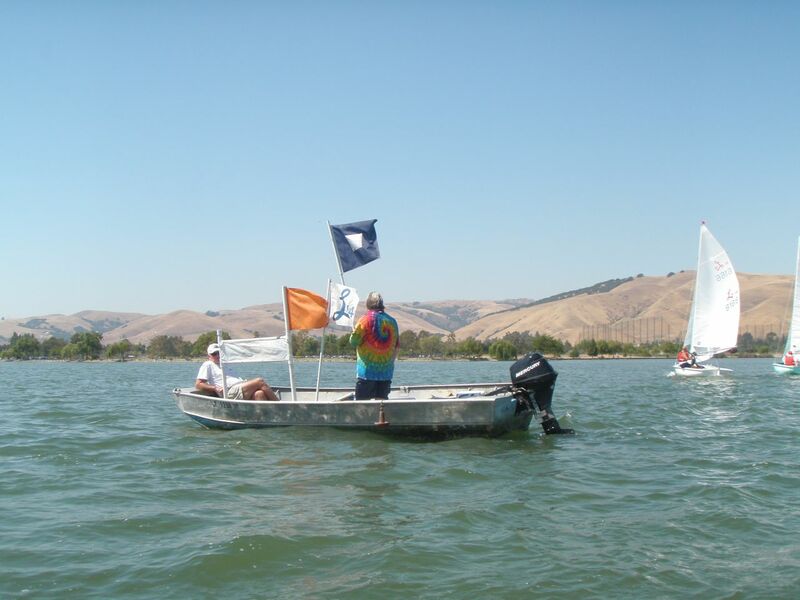 Joe and Vern setting us up for a windward-leeward-twice-around with the P flag up. Hugo and Mary testing the line. Joe and Vern relaxing on the committee boat. Butch in the background getting ready to start.